A series of anonymous bomb threats phoned in to authorities across Russia has continued with new threats in Moscow and St. Petersburg. 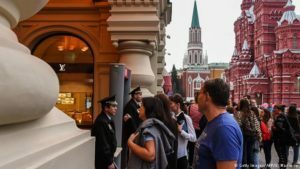 Moscow police sources say more than 9,000 people were evacuated from eight schools in the Russian capital on Sept. 14 as a result of anonymous bomb threats. Hundreds of people were also evacuated from several shopping malls in St. Petersburg on Sept. 14 following anonymous threats by telephone. Since Sept. 10, similar calls have triggered mass evacuations at schools, malls, theaters, and universities in many cities and towns across Russia. Peskov also said that “all necessary measures are being taken” to find the perpetrators. RIA Novosti news agency quoted an unnamed security official as saying that investigators had traced the calls to people based abroad who were linked to the extremist group Islamic State and other organizations. IS militants have claimed responsibility for a series of deadly attacks in Russia, including a suicide bombing in St. Petersburg in April that killed 14 people. “The phone calls were made via the Internet and therefore it will be difficult to locate the site from where the calls were made,” Shterk said. The first hoax bomb threats to be reported was on September 10 at the mayor’s office in Omsk when an unknown caller told authorities there was a bomb in the building. On Sept. 13, Moscow police sources say more than 100,000 people were evacuated from about 70 buildings after at least 65 anonymous bomb threats.